So yesterday’s litLAB meeting was a wonderfully productive session! This month’s theme with coLAB arts was Surveillance (which we did last month, too..in conjunction with censorship…whoops!). To set this apart from the other activities we’ve been doing, I looked around for a different type of exercise. I thought, well, we’re writers. We’ve been talking about oppression and all manner of systemic violence. But we’re all fairly comfortable – how do I bring that home? I often ask people to imagine living under/with/around the systems we discuss. I want us all to practice empathy in our writing. We must remember that the violence we discuss in our lovely, safe room is very real. Just because we are not directly living it, we are still in the same world with it. So we try to stretch our minds some more and place ourselves into some simulacrum of that climate. What do writers do when they can’t speak? As in they live under oppressive forces, like the kind we’ve been discussing? They may not be able to communicate directly, like those at Calvino’s table. They use symbol and allegory to say their piece and create art. So that’s what we did. Specifically, we were going to start making allegories. Allegories are works that use symbolism in a one to one correlation with something. Allegory can sometimes be very broad, or it can be incredibly specific to a population or even individual’s experience. Is that a symbol? Who knows! Surprise me next month! The exercise was to make their own allegory, using the tarot. They had to pick a sociopolitical force that surveils and oppresses. Doesn’t matter which. 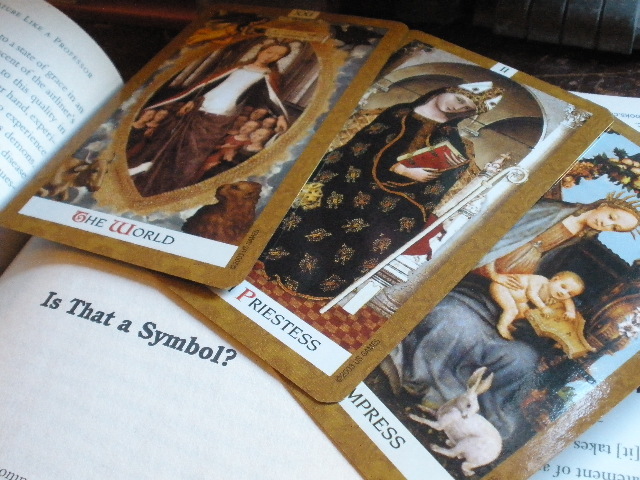 Next, to give everyone inspiration to form their own vocabulary of symbol, I took out my deck of Golden Tarot cards (by Kat Black), and had my merry crew pick one card from the major arcana. A figure, feature, color, anything from that card would be used to create symbolism for the figure/system they wanted to criticize. Then they took 2 or 3 from the minor arcana. 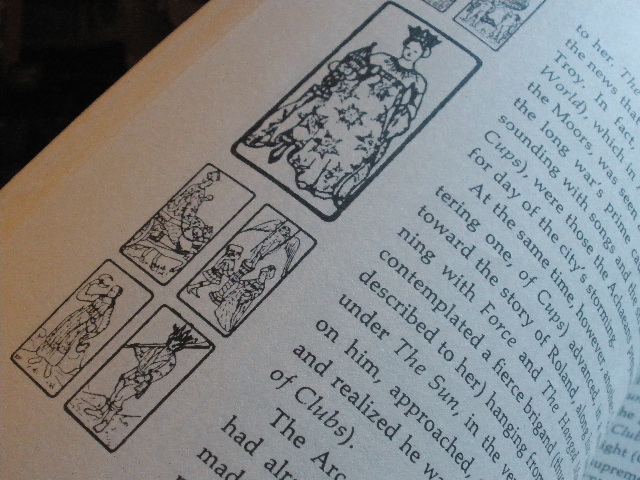 The minor cards would basically provide a smorgasboard of inspiration for all other parts of the allegory. I did this on purpose to give people a booster shot for their symbolic vocabulary. Writers do tend to get comfortable, with their own stock of words, images, phrases – I know I need routine shakeups, so why not the litLAB crew? I gave the barest explanations for how Tarot works because I didn’t want anyone hung up on “official” correspondences. I want to see what they do with these strange, dreamy images. We also changed up the routine a bit: no one read work yesterday. We all brainstormed, took notes, made outlines, and I sent the litLAB-ers on their merry way. I look forward to seeing what on earth the do next month! My only commandment is “surprise me”!